Given that I have now dedicated this blog entirely to music, it may not surprise you to learn that I am quite the music fan. Scratch that, I am a music obsessive. I have a CD collection over 200 discs strong (carefully alphabetised, natch), I own more band t-shirts than any other type of clothing, and I have been to more gigs than any sane person should be able to remember – only I can, because I have a creepy OCD document for that. 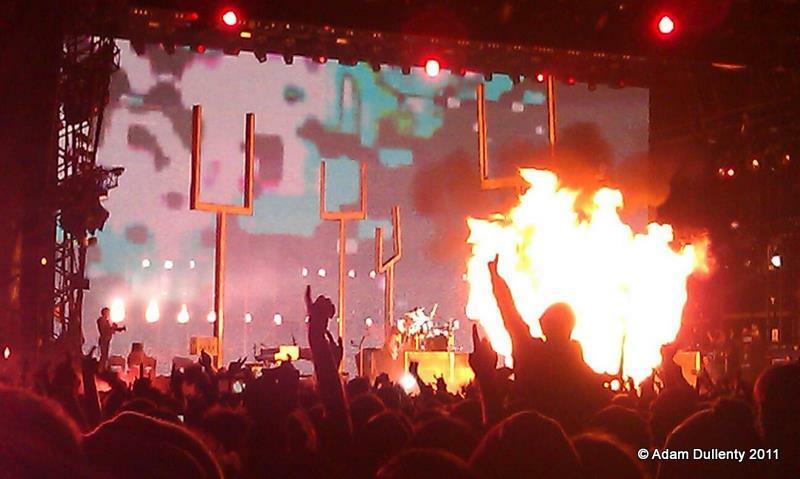 Muse at Reading 2011 - Rock yeah! So if you are like me, or even a little bit like me, you will like love Setlist fm. Maybe you’re already familiar with it? This site chronicles every gig played by every band ever. Or at least every gig that someone has uploaded a setlist for, and that’s quite a few. Great aspects of this site include the stats (oh, the stats!) and the geeky annotations (did you know that Muse’s headline set at Reading included a Sweet Child of Mine outro for Hysteria?!). What’s more, I was particularly interested to find out the other day that you can track particular bands that you are super-obsessed with. So now, I will get e-mail alerts everytime someone uploads a new Frank Turner setlist. However, whilst perusing the BBC’s excellent footage of Reading and Leeds, I stumbled across what appeared to be a competitor. You see, the BBC’s festival setlists are ‘powered by Songkick‘. This site offers something that Setlist fm does not: a personalised feed of all the local shows being played over the coming months by bands you like. Almost immediately, my girlfriend warned me that this was the perfect way for me to spend all of my monies, and more, on gig tickets, and indeed using this site requires a bit of willpower to resist going on a spending spree. You can also sync up Songkick with your iTunes library, Last.fm or Pandora account and it will import all your favourite bands, then show you when and where they are playing next – and how much it will set you back. This is powerful stuff, kids! Other big plus points include the ability to share which gigs you’re going to, or even just thinking of going to, in one click. I did this on Facebook and immediately found out one of my friends happened to be going to the same gig as me later this month. To answer the question at the top of this post, the answer is: use both. The actual setlist aspect of Songkick seems more like an afterthought as they aren’t that easy to reference quickly, so Setlist fm will continue to take priority there. Setlist fm is great for looking back over the gigs you’ve been to and Songkick is exciting and inspiring for finding out about gigs that are coming up. I wholeheartedly recommend signing up to them both.